For Vancouver health outreach worker Byron Cruz, the calls started coming steadily in 2012. Stephen Harper’s Conservative government had just made sweeping cuts to refugee health care, and Cruz was part of a vocal coalition protesting the cutbacks in British Columbia. 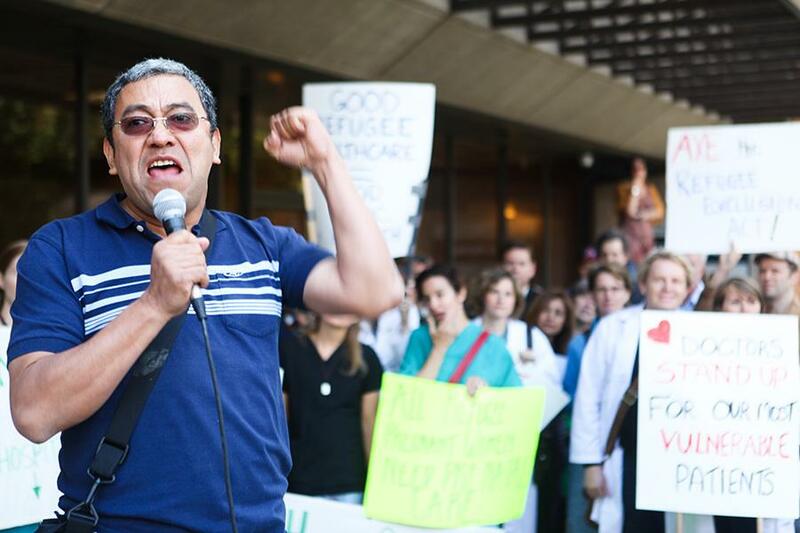 At the time he says it was mostly pregnant women with pending asylum claims calling for help, certain they couldn’t afford a $1,600 visit to a hospital delivery room. The calls can range from harassment complaints to requests for a reference at the food bank, but mostly he helps people see doctors and nurses. Since a lot of the people who call him work construction and cleaning jobs, he’s often sent photos of workplace injuries. The battleground for accessing healthcare with uncertain immigration status in the Lower Mainland has already shifted significantly over the last several months. Since August of last year two major health authorities in the region, Vancouver Coastal Health and Fraser Health, have in principle agreed to stop calling border services on patients—though in practice Cruz says those internal policy changes aren’t consistently implemented. In December 2015, a freedom-of-information request by the Georgia Straightfound that the Fraser Health Authority, which covers many Metro Vancouver suburbs including Burnaby and New Westminster, had previously referred about 500 patients to border services between January 2014 and October 2015. In a Facebook post in mid-January, Fraser Health announced it would stop doing this, but Cruz says so far proof of the change has been lacking. Vancouver Coastal Health, which runs Vancouver’s two main hospitals, is still working to fully implement its own internal policy for undocumented patients, but has told media it no longer makes referrals to immigration officials without consent from the patient. For Cruz this is good news—both victories worth celebrating, he says—but it hasn’t really slowed the stream of emergency calls. Undocumented families want certainty, and in the face of uncertainty, some are still too scared to see a doctor. As I think about this question, Cruz’s phone starts to buzz. “Is this a 911 call?” I ask. Later I ask Cruz what it feels like to be on the receiving end of someone’s 911 call at any moment of the day. Cruz says he’s constantly smoothing over relations with clinic managers, and starting over again when a new one takes over. And when he’s not working on the health system, he’s doing the same kind of door-knocking across Lower Mainland school boards. New Westminster was the latest to commit to developing a new policy to help undocumented kids attend school without risking their parents’ status in Canada. He’s been in conversation with Burnaby’s schools, too, in hopes they’ll agree to the same. All that clarifying, advocating and door-opening recently resulted in the City of Vancouver unanimously passing a policy that guarantees access to city services without risk of being reported to immigration (unless a warrant or other court order requires it). That guarantee does not extend to Vancouver police or social housing, but does include things like fire and rescue and homeless outreach. With that “access without fear” policy in hand, Cruz has set his sight on a new target: getting BC Medical Service Plan coverage for undocumented kids who are born here. It’s a step that comes with a hope he’ll receive fewer 911 calls.